This is the first time it occured to me looking at a message on the SQL Object Explorer which says “See Object Explorer Details for objects in this folder”. My first reaction is WTF I am in Object Explorer Explorer already. For you to know what I am talking about here is the screenshot. Now why does that happen? How will I see my tables? Do I just rely on T-SQL Scripts to manage the objects in my SQL Instance? Now let me explain why it happens. Object Explorer can only display up to a maximum of 65,536 objects and once you exceeded that limit you will see the message. 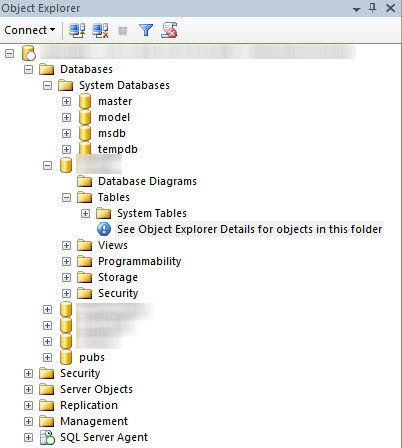 To continue viewing the remaining objects in the Object Explorer you have to close the nodes that you are not using but if that does not help for expample you are opening the Tables section where in you have 100K+ tables in the database then apply filtering is the best way to reduce the number of objects shown in one time. Now to do that is simple. Just right click on the Folder Object you are in a choose filter. 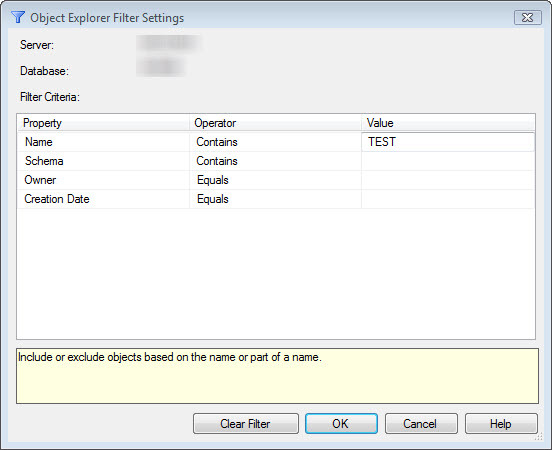 Which will bring you to a window which you can define your filter parameters. Im my example I chose all tables with the “test” on its name. Once filtered you will see a filtered tag beside the folder so it reminds you that the view you are using is filtered. To remove the filter is simply going back to the Folder and right click remove filter. Exactly what I was looking for. Good, detailed post. My database only has 3700 tables and I still get this issue.